Gold sequin jacket | Cosa Mi Metto??? What's better than a gold sequins jacket for a party during Christmas holidays? What you would wear for a Christmas party? Cosa c'è di meglio di un giacchino di paillettes d'oro durante il periodo Natalizio? Cosa indossereste per una festa natalizia? beautiful outfit, ideal for a christmas party! Volevo segnalarti un probabile bug sul tuo blog (probabilmente nel sistema che utilizzi per la pubblicazione dei post memorizzati e tenuti off line). Questo post risulta appena pubblicato ma porta la data del 15 dicembre e quindi non compare cronologicamente in cima alla lista delle tue pubblicazioni, perdendo quindi visibilità. The wholee look is so gorgeous but I absolutely love the jacket! And the black clutch is so cute :) By the way, the photos are so beautiful... you're a great model! You are so beautiful as always!!! nice pics, nice outfit. I wouldn´t wear necklace (althought is amazing) as you have already gold detail on your dress. Great jacket and I love your shoes ! è bellissima! l'adoro.. mi piacciono tanto anche le scarpe!! ottimo outfit! I really love this jacket!! Soo glamours :) Would love to have it for sylvester..
Love your outfit and that jacket is so cute! Love that jacket you have on. gold and sequence are my fav this season!! they have grown so strong this year!!! love love ur jacket pretty lady!! semplice e glamour, perfetto per le feste! Lovely jacket! You look fabulous! loved the gold color with the red lips!! I love the Hermes bracelet. JUST LOVELY. The bow on those shoes is too cute. 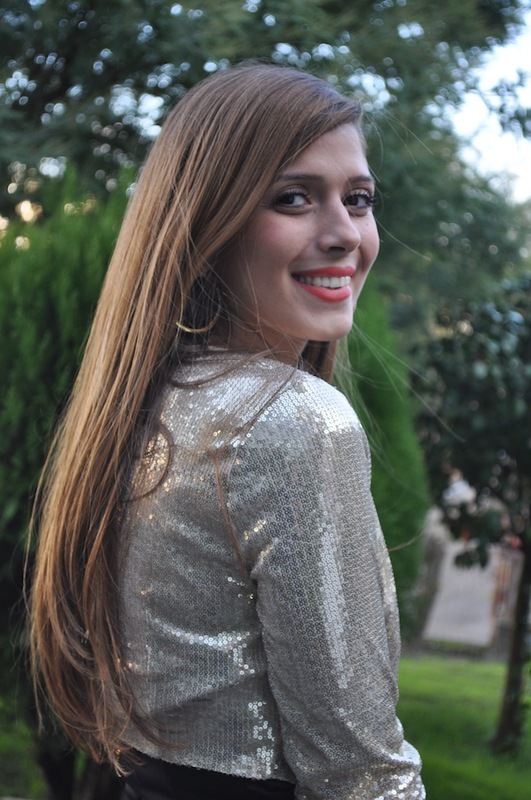 I love how you made the jacket the protagonist of your outfit, I want something with sequins for this New year´s eve! You look so beautiful! That jacket is gorgeous! La giacchina glitterata è perfetta in questo periodo ed in questa stagione ricca di glitter e paillettes! Forse avrei indossato collant coprenti;-)ma l'outfit è bello comunque! Very nice make-up and wonderful christmas look! You look fantastic! Love the jacket and red lipstick! Perfect party look! gorgeous outfit and jacket is great. love your jacket! adorable outfit! You look very classy and beautiful...Happy Holidays!!! You look Gorgeous in these pics! I Love everything about this outfit! YESSS!!! AMAZING and my fav at the moment :) I have a very similiar sequins blazer in black :) you look gorgeous! Love your look - your jacket is amazing...! Love the trend with glitters in clothes, great jacket great outfit! Lovely outfit. This jacket looks very very pretty! Have a lovely New Year's Eve ! You look amazing! I have the same bracelet! Thank you for all your kind words!!! grazie per tutte le vostre parole gentili!! !